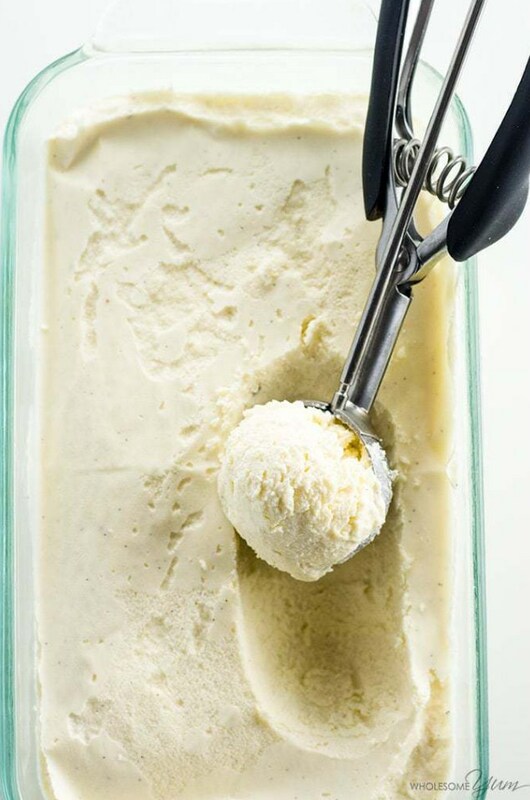 The best sugar-free low carb ice cream recipe is easy to make with just 4 ingredients & 5 mins prep! It's delicious keto ice cream you can feel good about. Pour into a large bowl and allow to cool to room temperature. Stir in the vanilla extract, and seeds from the vanilla bean, if using. Whisk in the MCT oil or MCT oil powder if using - this is highly recommended in general, and a must if you don't have an ice cream maker. Meanwhile, beat the remaining 1 cup (236 mL) of heavy cream using a hand mixer with a whisk attachment on High for about 2-3 minutes, until stiff peaks form. It's ready when you see a pronounced trail from the whisk on the surface of the cream, and the mixture doesn't pour out when you tilt the bowl. Do NOT overmix, you want barely stiff peaks but not extremely stiff.